Combined Task Force 150 a unit of Combined Maritime Forces (CMF) conducted a Focussed Operation called Azm-e-Ahan (Iron Will) in the vicinity of Bab el Mandeb Strait, Southern Red Sea and Gulf of Aden over the period 15 – 19 July 2012. 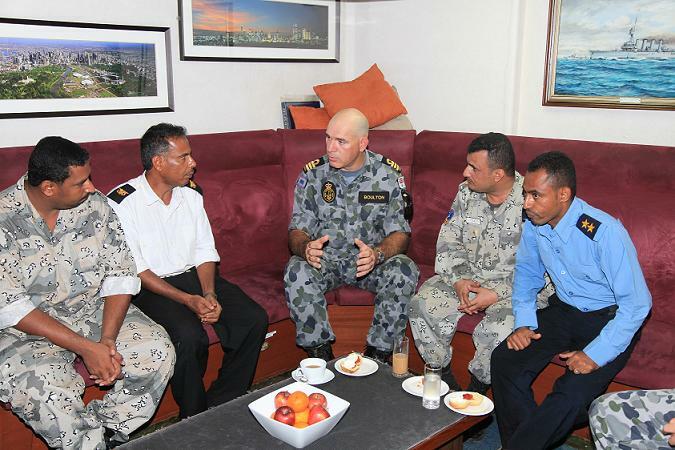 The Focussed Operation is one of a regular series of maritime security operations conducted in the region by CMF. Focussed Operation Azm-e-Ahan provided an opportunity for CMF to maintain a heightened presence in the Red Sea and area around the Bab el Mandeb Strait, deterring illicit activities and creating a safe environment for legitimate mariners. Coalition warships, helicopters and Maritime Patrol Reconnaissance Aircraft (MPRA) from Australia, UK and the USA participated in the operation. In pursuit of cooperation and knowledge sharing, officers from both the Yemeni Navy and Coast Guard embarked on CMF’s deployed assets. Airborne in HMAS Melbourne’s S70B helicopter, the Yemeni Officers assisted with the establishment of communications with the maritime industry and helped to identify local traffic and fishing areas. Particular attention was given to the collection of maritime “pattern of life” data, building cooperation with fishermen and utilising the Yemeni Navy local knowledge. Similar to previous operations, Focussed Operation Azm-e-Ahan provides by its presence, a positive symbol of maritime force, and at the same time develops the professional acumen of the multi-national participants. This promotes greater confidence in the maritime community to safely navigate one of the most important maritime choke points in the region. Previous Previous post: COUNTERING SOMALI PIRACY – SUCCESS, FAILURE OR STATUS QUO?